In the early days of online learning, for-profit schools tended to be the most dominant force. But things have changed drastically since then. Nowadays just about every school in the U.S. is providing some type of online learning, and a very wide array of private and nonprofit state colleges offer full scale degree programs online. If you feel less than comfortable about attending an online school that earns a profit, you now have a very wide range of nonprofits to consider. Both small and large nonprofit schools have moved into digital learning. For some small colleges and universities that have generally been known only in their own geographic regions, online programs have offered a new way of gaining national notoriety and attracting students from anywhere in the world. At the same time, larger state universities and even very famous private colleges have put degree programs online because it allows them to attract new students without having to spend money to expand campus facilities to house, feed and teach them. The result is that accredited non profit colleges and universities are now competing aggressively for students with the for profit universities. Nonprofits like Liberty University have become household names across the U.S. through large marketing campaigns. Although they’ve generated a massive volume of publicity in recent years, the fact is that for profit colleges and universities actually enroll less than ten percent of all American college students. That number appears to be dropping slightly, as not for profit schools get smarter and more aggressive with advertising and online promotion to push their online programs. What Does It Mean To Be A Non Profit University? On the surface, it seems pretty basic: A for-profit school’s primary role may be to deliver learning programs, but it is operated as a business. Universities like Phoenix and Capella have to earn a profit from the tuition they take in, while non-profit schools, which are generally either private or state-funded public schools, don’t make any attempt to earn a profit. For profit schools generally must demonstrate earnings to shareholders, while no-profits have a variety of funding sources, but no actual shareholders. (alternatively, here are lists of religious private schools: Christian Online Colleges, and Catholic Online Schools). Can a non profit school charge tuition? The answer is absolutely yes — virtually all not for profit campus and online colleges charge tuition. They only difference is that they do not need to show a profit above their costs. Some of their administrators, in fact, are paid millions of dollars and given the kind of career perks one would normally expect only a corporate chief to get. Additionally, the online teaching programs at non profits are sometimes run somewhat independently of campus operations, and may have very high revenue goals for the school. 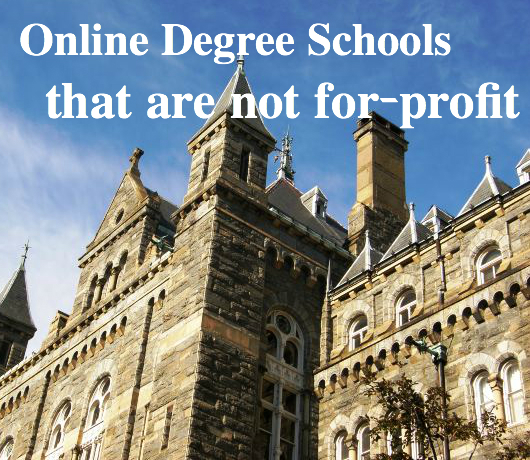 As a result, a nonprofit degree from an online college may not necessarily be your cheapest option. To you the student, the most first and most important issue is to make sure that any school you consider is accredited (keeping in mind that regional accreditation is the best, not national accreditation), that the degree program is targeted at a specific career that interests you, and that you will not be piling up too much debt during your education. Those all hold true whether you attend a for profit or non profit school. You will probably tend to find that accreditation is less of an issue with nonprofit schools, but don’t assume anything – make sure to research it yourself. Generally, the non profit schools are more targeted in their online program offerings. They tend to focus more squarely on career training than private and non profit schools, which sometimes offer hundreds of degree programs in fairly exotic subjects. A few nonprofit schools listed below focus on just one or two online programs they’ve chosen to build a expertise in. What Exactly Is A Nonprofit, Private or Not For Profit College? The schools on this list tend to call themselves one of these three things. Is there a difference between the categorizations? Not really. The IRS says that “not for profit” describes an organization focused on one particular activity (like a hobby) while “nonprofit” is for an entity created for a purpose other than making a profit. If you think those two sound pretty similar you’re right. In practice, “nonprofit” and “not for profit” are used interchangeably. The two main types of schools in the non profit category are “private” colleges, which include many of the oldest, best known and most expensive schools in the U.S., and “public” schools, which are state or community schools that are supported financially by taxpayer money and administered through state governments. A Catholic private university located just outside Chicago, Illinois. The school, founded in 1887, describes itself as a “melting pot” of students from all religions, faiths and philosophies, and now provides a variety of degree programs online.